Duck hooks can get you into trouble. A duck hook is a shot that curves hard to the left of your target, if you are a right-handed golfer. A duck hook almost always gets a golfer into some kind of trouble on the course. A closed club face at impact and an inside-to-out swing can cause a duck hook. Learning to swing with a square club face, to release the club properly and to swing on the proper path will help eliminate your duck hook. Grip the club with the fingers of your left hand first, so you still can see two knuckles on your left hand. Then grip the club with your right hand so your right thumb and index finger point to the right shoulder. Your right-hand pinkie finger should rest between the index and middle finger of your left hand, or interlock with the left index finger. You should still be able to see two knuckles on your left hand grip. This neutral grip will help keep your clubface from closing during the swing. Swing the club back and point the toe, or rounded edge, of the club straight up when the club is hip high. This will keep you from having a closed club face on the backswing. Straight left arm on backswing. Keep your left arm straight as you swing to the top of the backswing. A straight left arm position helps you avoid an early release on the downswing. An early release occurs when you lose your wrist hinge and the club face closes before impact. 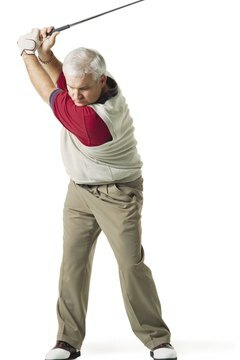 Stop your backswing when your left shoulder is under your chin. Turn your hips toward the target to start the downswing. Your arms will naturally follow your hips down. Keep turning your hips toward the target as you approach impact. This will help keep the club from releasing early and help you swing the club down on the proper path. Keep the club face square as you swing through impact. Don't allow the club to rotate over as you swing through impact. Keep turning your hips until you finish your swing. Your belt buckle should face the target at your finish position. John Wagner is a certified golf instructor and professional golfer with more than 10 years of experience. As a certified GolfTEC, TPI Level 3 and Chuck Cook Golf Instructor, he has given more than 9,000 golf lessons. 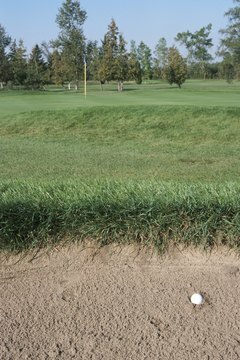 How Do I Hit a Golf Ball Straight Every Time?